It won’t fall apart will it? Is the paper water proof? Stick the label on top. Stocked up on your essentials? It is the best one yet. About the poet : Lakshmi Anantnarayan describes herself as “just a 40 something person learning to feel happy taking pictures and scribbling I guess”. We would like to add that she does much more and, amongst other things, is an excellent photographer. You can learn more about her and her work at https://storygarage.org/about/people-contact/ and read more of her prolific “scribblings” at https://oldbrownshoes.wordpress.com/ . Cities threaten us – with pollution, with traffic, with papers full of crime. We are even threatened by the number of classes the neighbour’s kid goes to “Music, soccer, cursive writing and Tuition! !” you say to her with a gritty smile “Wow!”. We forget the simplicity of our own childhoods. The big green trees, the vast abundance of time, the easy conversations. The time when vacations lasted months – not the “long weekend” which is invariably too short. We forget a time with a lot of time. We think the city habit is a necessity. And breaking habits is hard, so we adapt. We make financial plans, and factor in “quality of life” as one line item. To achieve this quality of life we then work long hours and weekends, otherwise we risk missing that increment, that EMI. And we give that small inner child seeking open green spaces the lollipop of a “park facing” house. I lived this very life for many years. But something never felt quite right. Many things about our city life – the ironies and absurdity – bothered me. But when my six year old son started wheezing and the doctor and some friends said it was pretty common in city children, we were forced to relook at our priorities. In Goa, Chail, even Allahabad my boy breathed clean as a whistle – but he choked up the moment he entered the city. And I didn’t think any city or career was worth putting my little boy on medication. So after 20 years of corporate urban life we decided to leave the city. My wife had wanted to move to a simpler life in a greener nicer place for years. But quitting the rat race can be hard if you’re married to a rat. We moved tentatively – unsure how long we would stay. We rented a place instead of buying or building. I quit my city job but switched to consulting so I continued to work remotely. We rented out our city house – so we could go back if needed. We weren’t far from Delhi – an overnight train journey. The move was a big change for everybody. A family of four, it would have to work for each one of us. The biggest change was for the kids. They had moved from a massive urban English medium school to a tiny rural Hindi-medium one. My wife – a US licensed psychologist – moved her practice to phone & Skype and – surprisingly – still retained half her clients. She published her first book, and has even added new clients after moving here – and now does dedicated therapy retreats where people work with her one-on-one in these serene surroundings (curious? www.vanditadubey.com). neighbour has five cows, and my daughter – a newly discovered naturalist – knows each one personally. No milk-enhancing injections or funny fodder here. And the milk is so fresh it’s still warm when it reaches us. Vegetables and fruits are often plucked from the local farms and orchards. We don’t need RO Filters. TV’s are few, and watched lesser, so people talk more. And the few TVs around look like TVs – not like king size beds tacked to a wall. “Throughput” in management speak “has gone down”. We earn less (money). We spend less (money). But we have a lot more time. We go for long walks and explore the mountains around our house. I play a lot more with my kids. Badminton, Monopoly – whatever. Last October we completed our first trek as a family. My son, now 8, walked 30 km over 3 days – up and down mountains – without any problem. My daughter rode a mule – and developed a relationship with it. She now wants one to ride to school everyday. My kids don’t go to any classes or tuition. They enjoy school, and live without pressure. They learn much from nature – and from an awesome science teacher in their school. Their curiosity is alive and well, and with the internet available (yup – we have broadband!) – in a controlled manner – they have access to learning beyond what the school offers. And we have time for them. We don’t fear crime or traffic. We often leave our doors unlocked. The kids – 7 & 8 years old – walk to their friends’ houses without any adult, and sometimes the 3 km to their school. Sure, we have to deal with the occasional scorpion. And keep our dogs safe from leopards. But the threats here are fewer and less vicious than those in the city. Everything has not gone perfectly. Our son took a while to settle in. Initially he missed his school, and his old friends, and felt like an outsider. My travel was rather gruelling – 10 days a month can feel a lot more than one-third. And sometimes the lack of urban options and choices does irritate. But all things considered, we love our new life. It has been a year now, and I don’t think we are going back. Sure, the city offers some good things. But they are no match for the many great things we have discovered away from it. Writing is Easy. Yeah right ! It is a pleasant afternoon. We have those often in the Himalayas. I sit down to write. My wife – a psychologist and mentor – is on the phone coaching a counsellor about something that sounds rather juicy. She notices my attentive eavesdropping and leaves the room. I turn back to writing. I am short of my daily target of words to finish my novel. Yesterday, the words just flowed. Not today. A Facebook alert pops up on my screen. I stare at the intrusion. A reflective brain thinks but a reflexive finger clicks faster. Almost subconsciously, I am chatting with some obscure acquaintance. I learn that her daughter has colored her hair blue. And she wants a place in the mountains. But with a/c – mainly for her heat sensitive pet. At 6200 ft, I don’t even have fans in my house. I end the chat. I scroll Fb. Brexit update. So now EU sounds like Ewww? See the cute puppies video. Get the latest Trump news – what’s wrong with America? See Dipa Karmakar’s vault – again. Indian sports history will remember her posterior for posterity. What a touching moment. “Mat finish” says one part of my mind. “No empathy” says another. Sigh! Politics and Religious fundamentalism bait me into pointless rants. Full of wisdom, I resist and shutdown Fb. Alone, I focus. Still no words. I think of creative ways to unblock. Vaastu? I turn my chair to face south instead of west south west. The vacuum continues. I put on a hat – maybe that will focus the thoughts. Nah. I put on my full-face motorcycling helmet. Still nothing. Maybe a cup of tea will help? I put the electric kettle on. The power fails. “Should’ve picked a village with full power backup.” I chuckle and grumble. I transfer the water to a pan and set it on the gas stove. Waiting for the water to boil I vacantly look outside. The kids have left a bike out, and it is cloudy. Might rain. Still helmeted, I step out and move the bike to the store. Our store has two rooms. I have intended to make one into a writing room for a long time, to stay away from the distractions in the house. I look around at the mess and see some books that I was intending to give away. I set the bike down, pick up one of the books and leaf through it. Turning the fourth page I find a royalty cheque of 46 rupees from my first book. It is dated January. Sheesh, what a waste! I wish I was better organized. Just then Munni – who thinks I am goofy anyway – walks in and asks why an empty pan is on the gas. She sees me in my helmet and runs away. I run after her – but to the kitchen. The steel pan looks like a rainbow on steroids, with colors ranging from rosy pink to burnt black. (As a full-time writer, I know writing is hard. Starting a book is daunting. Keeping it going even more so. Daunting enough to ignore, avoid, not put on to-do lists. Or only put on to-do lists. That is why my friend Roy and I are doing the writing retreat. We understand. We hope the retreat will keep you – and us – on track and fill the world with more high-quality books. Leave the city? And ruin the kids future? She swallowed the food, but not my reasoning. I could see that my logic completely missed the mark. Let me try again here. The essence of what I told her was that my wife and I were not necessarily looking for a highly competitive school with lots of tests / tuitions / cutting edge technology. Quite the opposite – we were looking for a simple school. One where kids stayed innocent a little longer. A school where our kids would be happy and enjoy the learning process. Both my wife and I remember school as a stressful, unhappy place. But we believe that joy and learning are not contradictory, and should not be. The last one year has largely borne out our beliefs. Our two kids moved from a large, urban school to a small rural one*. Both schools follow a similar belief system and methodology – but differed in many other things, including the medium of instruction. Our kids left all their old friends behind, and how quickly they adapted depended a lot on how quickly they made friends. Our daughter R was not yet seven when we moved. She loved the open green spaces and all the natural beauty of the mountains and she was perfectly at home within the first few days. A was eight, and took longer to adjust and get accustomed to the new set-up. But they have both adjusted and evolved in their own way. R has embraced everything around her. Whether it be butterflies, or what the cow eats, and when it gives milk, to how long a pony lives or what a horseshoe does – she is seeking out knowledge of nature and our surroundings with an amazing curiosity. Her Hindi has improved a lot, and she now speaks two versions of Hindi – one in the house, and the other with her Kumaoni classmates and friends. The difference is drastic. And of course, she is picking up some Kumaoni as well. A is more reserved, and took longer to make friends. But he has been able to get deeper into things that interest him. The stuff he now chooses to do are driven by an inherent personal interest, rather than the influence of friends or peer pressure. He has developed a deep interest in paper folding which he feeds by teaching himself stuff from the internet. He has also developed an interest in Chess, and plays that with the computer and also some of his classmates. They are learning about life from the cow next door having a calf. From our pet dog delivering a litter of six pups, taking care of them, and the pain of giving them away. They learn from finding the skull and bones of small carnivorous rodents in the forest, taking them to school and researching them. And learn about life simply from the extreme seasons, and understand what grows and when. They don’t just study the relationship between the seasons, and when fruits ripen – they live it. One of the most satisfying things for me personally is the interest they have developed in Hiking. We have done two hikes, the last one being a six day hike to Pindari glacier. R rode a mule while A walked 60 kilometres up and down forest trails with small backpacks over 6 days. What surprised me most was that on the last day of the hike A was already planning the next one! But above all this, the biggest factor is the time I am able to spend with them – be it reading together with them, going on picnics, playing games, plucking fruit or doing small woodworking projects. Being a father in person beats being a father in absentia hands down. And I’ve been both. Since we have left the city I have much more time for them, and they both notice and appreciate the change. We all love the time we now get to spend together. And that’s hard for even the best school to compete with. 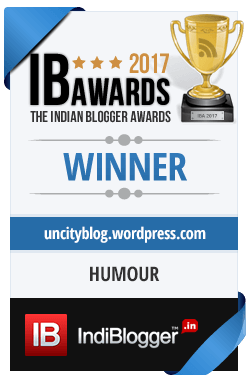 *This blogger relocated to the Kumaon Himalayas from Gurgaon, and the fun stuff he does besides trekking, writing this blog, riding the Himalayas, running marathons and contemplating the universe now also includes hosting the Himalayan Writing Retreat https://uncityblog.wordpress.com/retreat/ . “So what do you do here?” the uncomprehending visitor asks, waving vaguely at the surrounding lack of an office. It is not just a question of income. It is a question of identity. Most urban professionals define themselves by what they do. Work is identity. I recently met a city someone at an event. We spoke for 5 minutes and I knew enough to create his linkedin profile : McKinsie, Genpact, teaching at a B school … the works. I knew everything about him. Or maybe, I knew nothing. The past 18 months is the longest I have been without a full-time job since college. * Quitting full-time work creates a vacuum. I think it is easier for my wife since she worked limited hours in the city and works limited hours here. Harder for me. Right now my answer to the “work” question is a long winded “Oh I do some consulting and write a blog and am working on a book, and am getting my website off the ground … and so on”. It used to be much clearer when I just said “I run a company called HCL learning Ltd”. Clearer – even in my own head. Now, there are 3-4 things that I do – not just to earn an income (some of them – like this blog – earn nothing) but to find meaning. I do some consulting work. I am working on a schooling website called Kyaschool. I am working on a book, and I write this blog. “Is it easy to quit full-time work?” You ask. My answer depends upon who you are. If you are a city type looking for inspiration or a hero to worship, I will happily oblige with a nonchalant “No big deal”. But deep inside, there is anxiety. I am no longer a CEO / President / whatever. I have given up the label that used to define me, so who am I now? Author? No – to earn that title I should’ve written something I feel truly proud of. “The Bad Boys of Bokaro Jail” doesn’t count. And this blog is too young. Start-up guy? Hmm – but the site I am putting up is a duct-tape and bubblegum effort with a virtual team, and little expertise. There is a fair chance the whole thing will bomb. Or www.Kyaschool.com may be reduced to just a collection of Videos and Blog Posts. Consultant ? Okay. It is a vestige of who I used to be. It is also the safety line back to full-time employment if I ever were to seek it again. Makes me feel less “left out” and a little more connected and relevant. So my resume (which, Insha-Allah, I will never need) does not have the dreaded “gap”. In many ways it is clinging to the familiar, because letting go of everything known is scary. It is so hard to just be me. It is not the worlds labels or expectations I am dealing with. It is my own (dis)comfort with being this new, free, unlabeled person. Don’t get me wrong – work matters to me. Thing is, I want to do work that matters. Over time I hope I will be able to let go and shift away from the security of the familiar into completely new areas which I know nothing about, but which matter somewhere deep inside. It could be waste management. Or something education related. Or writing. I agree. But I do wonder how long the gestation period is for rebirth.